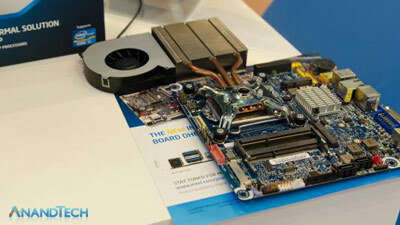 Intel demonstrated a new variant of the Mini-ITX form factor at Computex in Taiwan last week. 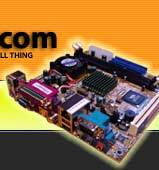 They are calling the form factor "Thin Mini-ITX". Intel demonstrated AIO (All In One) machines and thin consumer style chassis on the show floor but they also see room for a low profile board in VESA mounted machines, ATMs, casino gaming machines and plenty of other vertical markets. 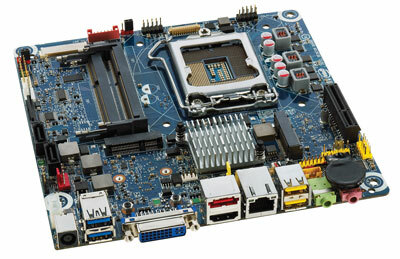 The main characteristics of Thin Mini-ITX are: Mini-ITX (170 x 170mm) motherboard size; 20mm maximum height; 25mm high I/O shield; up to 65W TDP desktop CPU support; internal display connectors; SODIMM memory and an external power supply. 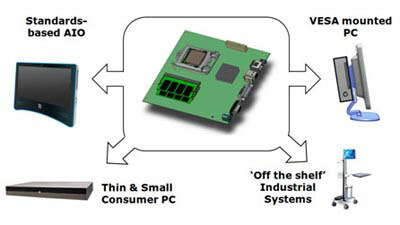 Low-profile Mini-ITX motherboards already exist using lower power consumption processors soldered directly to the board. 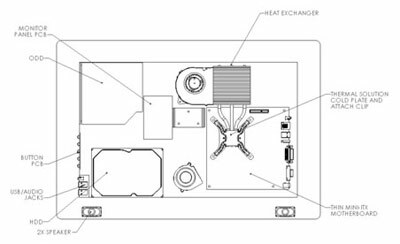 Intel's specification for Thin Mini-ITX allows motherboards to define 'keep-out' areas outside of the traditional Mini-ITX motherboard square to fit custom CPU cooling solutions. Intel demonstrated a Socket 1155 motherboard with a heat-pipe and externally mounted heatsink connected to a side-blower fan.